The sound of it is melodic; it’s an initially slow beat that builds up to a wild dramatic climax, and then ever so gently slows to an exhausted tempo. This sends a signal that it’s almost time to make the taste buds sing a chorus of instant gratification and high praise. Popcorn, whether cooked in the microwave oven, on a stovetop, or in any style popcorn machine made its way into the homes and hearts of Americans on a mainstream level around the late 19th Century, and remains one of America’s favorite snack foods today. Popcorn, typically made up of three elements – the germ, endosperm, and pericarp (hull) – is a whole grain that is actually a member of the grass family, and scientifically known as Zea mays everta, or maize. According to www.history.com, the first traces of popcorn were discovered in Peru as early as 4700 BC, though corn was domesticated in Mexico a few thousand years earlier. This naturally irresistible “pop” star is only one variety of maize, a species that consists of four types of corn including sweet, field, flint, and pop, the latter being commonly found in heavily popcorn producing states – otherwise known as the popcorn belt –including, Illinois, Indiana, Iowa, Kansas, Kentucky, Michigan, Missouri, Nebraska, and Ohio. Whether referred to as “Pearl”, “prairie gold”, or just popcorn, this aromatic and light treat that offers a delicate crunch has played a large role in cultures all around the world, from being incorporated into certain Indian regalia rituals in its uncooked form, to being synonymous with a night out at the movies in America. Throughout history, popcorn has been served ground up; as a breakfast cereal with sugar and cream; but most commonly, naked. Today, popcorn remains a top-selling snack, seeing as many people associate it with good times, entertainment and health. As a matter of fact, Joe Vinson, chemist, University of Scranton, PA, says that popcorn may be the perfect snack food, adding “It’s the only snack that is 100 percent whole grain…[and has] antioxidants and a lot more ﬁber than most other vegetables and fruits,” according to www.wholegrainscouncil.org. Reportedly, in 2015 alone, the popcorn industry sold over a billion pounds of the coveted food; and, as reported by www.prnewswire.com, the global popcorn market is forecasted to grow at a CAGR of 7% during the period 2016-2020. Additionally, as published by www.popcorn.org, Americans consume more that 14 million quarts of popped popcorn each year, which equals approximately 43 quarts per person. So why are popcorn and its coveted flavor so popular? One of the main market drivers, aside from nostalgia, is new flavors. Popcorn is the definition of a versatile base when it comes to culinary innovation. Prepared either sweet or savory, popcorn is a gastronomic staple that lends itself to a variety of innovative recipes and has the undeniable ability to lure in consumers. Nowadays, lovers of the “amaizeing”, corny treat can find popcorn incorporated into breakfast pancakes, popcorn balls, popcorn pastries, and a long list of etc. while its flavor lends itself to top-selling frozen desserts such as gelato, ice cream, ice cream sandwiches, and frozen pops. Undoubtedly, taking two American favorites (popcorn and frozen dessert) and blending them into a unique culinary offering is a recipe for definite success, especially when creativity is apparent. Because popcorn is the perfect canvas for instituting interesting flavors and combinations, it’s easy to create original recipes. Utilizing everything from chocolate to caramel, fruit and nuts, any variety of cheese and herbs, spices, and even fruit can make blended popcorn flavors hotly sought after even in frozen dessert establishments. As a dedicated resource for unique recipe innovation, PreGel’s International Training Centers has developed several inspiring recipe ideas with our Popcorn Super Sprint to share with you. 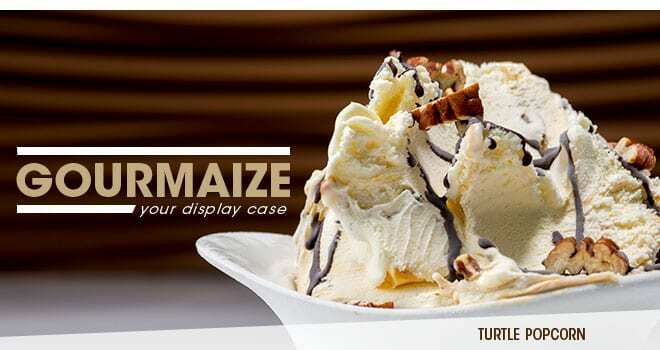 Our goal was to take the flavor of this iconic dietary staple and transform it into a treat that can work for artisanal frozen desserts whether served plain to highlight its subtle buttery flavor, or blended with a selection of toppings and inclusions to “gourmaize” your display case. Try these recipes and let us know what you think, or share with us on Facebook how you’ve taken popcorn and turned it into a spectacular artisanal treat…further proving why popcorn is definitely a flavor for business owners to keep in their menu offerings.